Getting kids to eat their veggies can be tough, but when we mix the veggies into other foods sometimes it’s a little easier! 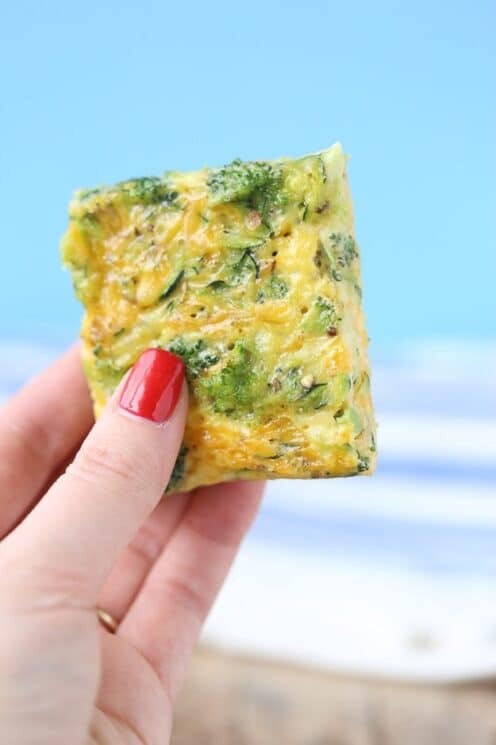 If your kids love eggs, try our new Broccoli and Zucchini Egg Bars, inspired by My Fussy Eater! 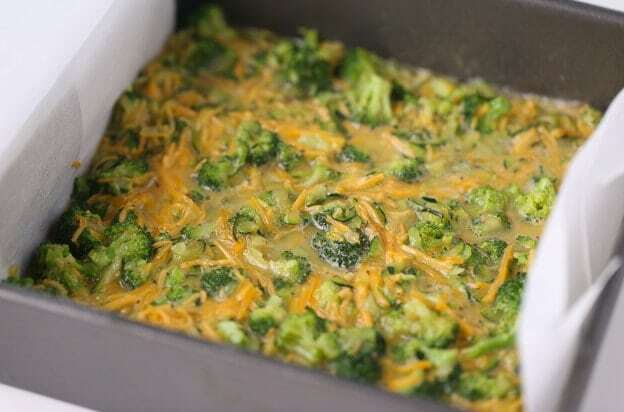 It’s an egg casserole with the veggies baked right in! You can pop this dish in the oven for it to bake for 15 minutes and you can run around the house finding that missing shoe! 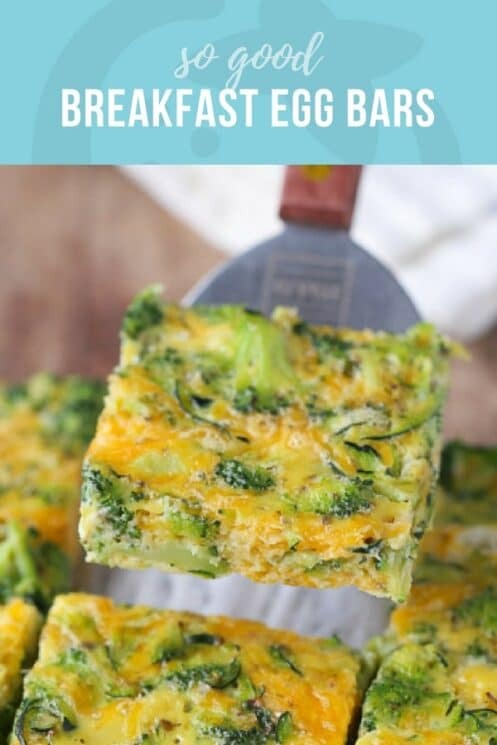 This will be a new family favorite for breakfast. 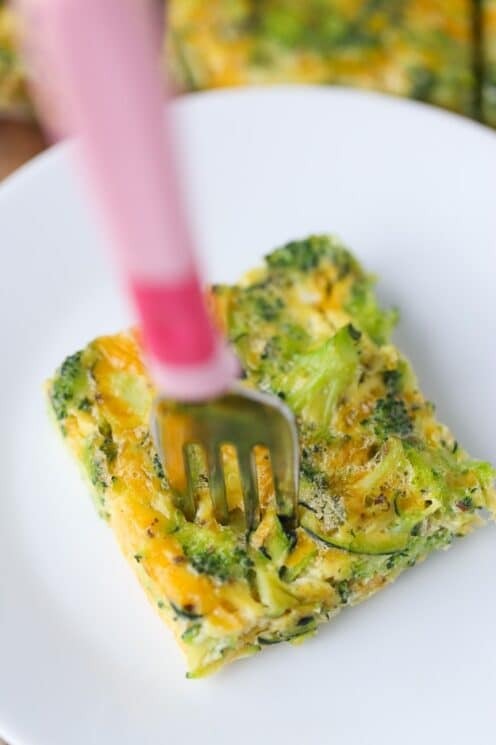 Chop up your broccoli into little florets and grate your zucchini. Don’t worry about all the moisture that comes out of the zucchini, that will help to steam the veggies. Place the veggies in a frying pan and cook them for just a few minutes. This helps to give the veggies a head start on the cooking process and will evaporate extra moisture. In a separate bowl you’ll whisk together the remaining ingredients and then add the veggies. Pour into a pan and bake! Is the Egg White or Yolk Healthier? Eggs are known for being a great protein source, but are less known for giving some great vitamins and minerals. There is more protein in the egg white than yolk, but the yolk still does contain protein. The yolk may contain all the fat, but it also contains most of the vitamins and nutrients. The yolks are where it’s at if you’re looking to up your intake of vitamins A, B12, and D, as well as your daily calcium, folate, and omega-3s. The slices come out perfectly so they’re even great for breakfast on the go! Eggs for breakfast is always a win because they’re packed with protein to keep your kids full until lunch. If you love this recipe you need to try our Egg Cups! What Can You Eat Eggs With? There aren’t many foods as versatile as the amazing egg. From baked goods, to omelets, souffle, poached, boiled, fried……..on and on. Some of our favorite things to eat with eggs are Crepes, on top of an open faced sandwich, baked into an avocado, on top of breakfast hash, scrambled and in a baguette, on a breakfast pizza, huevos rancheros, with green veggies, and on avocado toast. 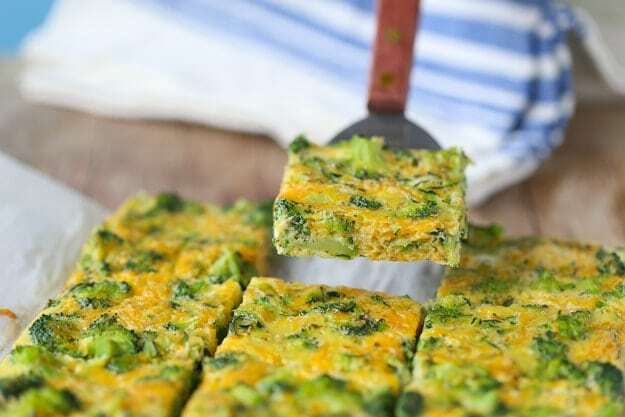 We love these breakfast egg bars because you can include seasonal veggies in them, and then top them with salsa, plain Greek yogurt, salsa, cholula, so many possibilities! Recipe inspired by My Fussy Eater! 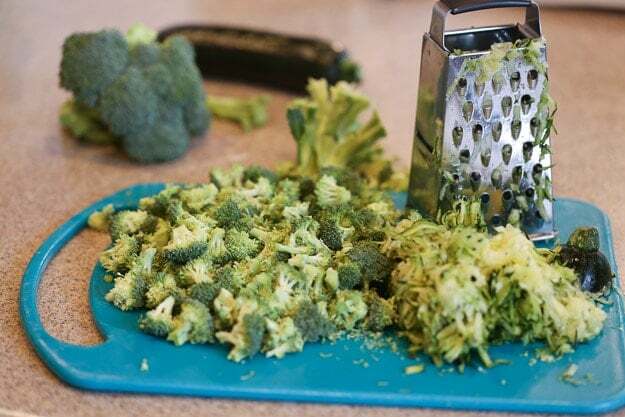 Can you use frozen chopped broccoli? Looks delicious! I’m wondering how long they will keep in the fridge once cooked, for a convenient make ahead breakfast option. What to replace zucchini? I don’t have zucchini nor cucumber now. Thank you ??????? ?